Duck and goose down sleeping bags have many advantages - but they might not be the best option for family camping. 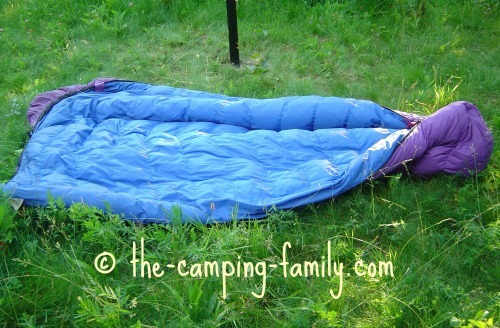 Read on to learn why I don't recommend down filled sleeping bags for most families. Where does down come from? Down comes from geese and ducks. If the tag says "waterfowl", assume that it is a mixture of duck and goose down. Is goose down better than duck down? Not necessarily. The quality of the down depends on the birds' age and environment. Birds living in cold, wet conditions grow down that is fluffier and warmer. All else being equal, goose down is warmer than duck down, because goose feathers are longer than duck feathers. That's why goose down is more expensive than duck down, and why most down sleeping bags are a mixture of both types of down. Are the birds harmed to make a duck or goose down sleeping bag? That depends on how the down is harvested. Some down is gathered from abandoned nests. Icelandic Eiderdown is harvested in this way. No birds are touched at all. As you can imagine, this type of down is extremely expensive. Some down is "hand harvested". Although the name sounds harmless, this method is actually inhumane. Feathers and down are pulled from live birds. This causes distress to the birds and is condemned by animal lovers. It's banned in many countries. Most reputable outdoor gear companies ensure that their suppliers do not use live harvested down. Some down is collected as a by-product from birds that are raised for their meat. This down would otherwise be discarded when the birds are killed. If you are okay with eating meat, you will probably be okay with using this type of down. Why is down so warm? Down is the world's best insulator. Here's how it works. The tiny plumule filaments overlap to trap pockets of air. Your body heat warms the air in the pockets. Down is the warmest insulator for its weight. A duck and goose down sleeping bag rated for a particular temperature will be lighter than a synthetic bag rated for the same temperature. When I lived in the Arctic, my heavy-duty down sleeping bag kept me warm even when the temperature was so far below freezing that frost fell in the tent like snow! If you've ever slept under a down duvet, you know that down is light, fluffy and cozy all at the same time. Since down is breathable, it isn't overly hot in warm weather. 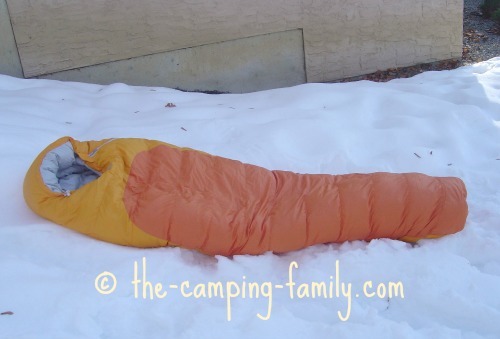 You can enjoy a duck and goose down sleeping bag even in the summer. If you care for a down bag properly, it will last for generations. 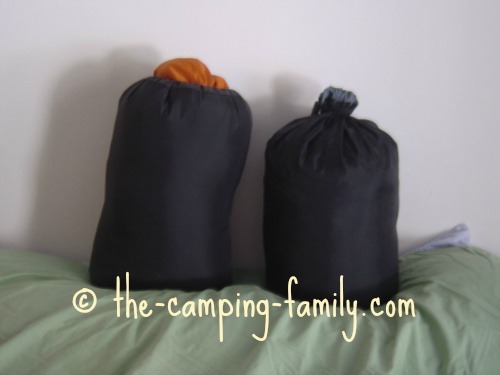 Here's what you need to know about down sleeping bag cleaning and about sleeping bag storage. Down is very squishable. It packs very small, compared to a synthetic bag of similar warmth. The duck and goose down sleeping bag on the right is actually much warmer than the bulkier synthetic bag on the left. This is especially important to backpackers, but is relevant for car campers too. There is a limited amount of space in even the largest of vehicles! Down filled sleeping bags are more expensive than synthetic bags. Buying a good duck and goose down sleeping bag is a big investment. That investment will pay off in the long run, though, since down lasts for such a long time. Some people are sensitive or even allergic to down. Down loses virtually all of its insulating power when it is wet - and it takes a very long time to dry. This is the biggest drawback, in my opinion. For family camping, this can erase all of down's advantages. You don't want to be stuck in a tent with a heavy, sopping wet mass of down and no way to dry it. If there is any chance at all of your sleeping bag being spilled on, leaked on or soaked in any way, I don't recommend that you buy duck and goose down sleeping bag. Even completely toilet trained children have been known to have unexpected accidents on camping trips! Most down filled sleeping bags are mummy bags. That makes sense, since a mummy bag is the warmest option. 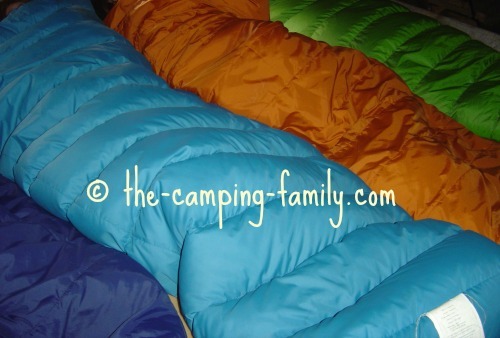 Click to learn why mummy sleeping bags are so warm. This down bag is an economical choice. However, not everyone enjoys the feeling of being in a mummy bag. Some people feel downright claustrophobic in a mummy bag! 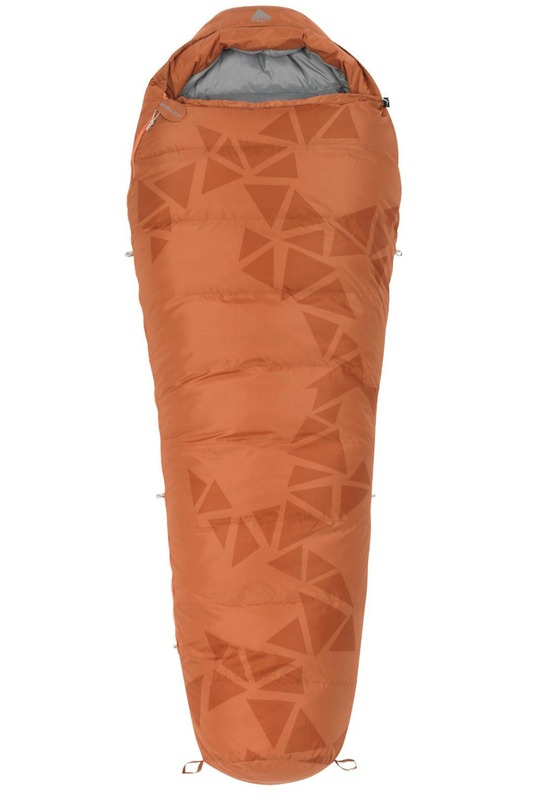 If that's you, look for a rectangular down sleeping bag, like this one. Like most rectangular bags, it can be unzipped and used as a comforter - or you can zip two bags together to make a double sleeping bag. Some down bags are warmer than others. Some manufacturers rate their bags for specific temperatures. Read this to understand those sleeping bag temperature ratings. Others give a "fill power" or "loft power" number. This is a measure of its fluffiness. The number tells you how many cubic inches of space can be filled by one ounce of down. The fluffier the down, the warmer the bag. A fill power of 550 is warm. A fill power of 650 is warmer. A fill power of 750 or higher is the warmest. This bag has a fill power of 650 and is rated for 28 to 37 degrees F (-2 to 3 degrees Celsius). This would be a good bag for spring, summer and fall camping. 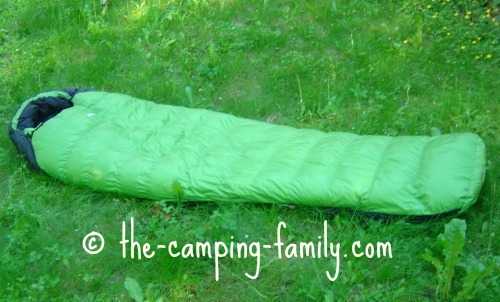 It has loops that attach to your sleeping pad so that you don't roll off in the night! This bag has a fill power of 800. It would be too warm for anything but the coldest conditions - but if you are planning any winter camping, this is the bag for you! It's water-resistant and has a lifetime warranty. Without a doubt, down filled sleeping bags are the best cold weather sleeping bags. However, they are virtually useless when they get wet, which makes them impractical for family camping. 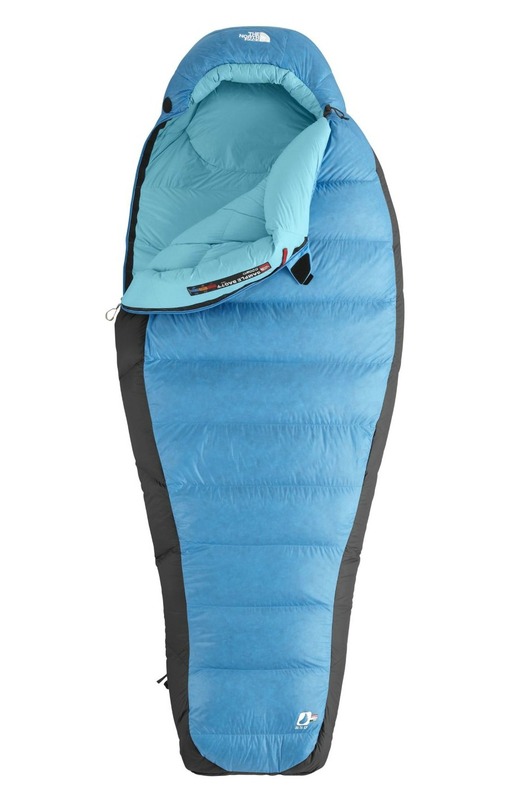 Unless you plan on doing a lot of winter camping, I recommend that you buy synthetic sleeping bags. Now that you know all about down filled sleeping bags, click here to learn about the other types of camping sleeping bags. Planning a camping trip? 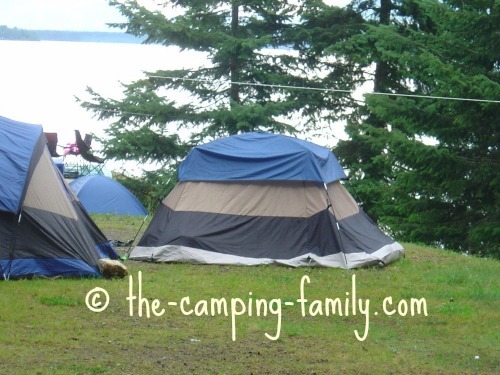 Visit The Camping Family home page for information on everything to do with your trip.